Get the 2-D z-projection of the result of getBoundingCube(). Draw the object on canvas. Undraw the object from canvas by clearing the bounding box. Signal that will be triggered whenever the node changes state. GxNode is the base class for all graphic objects. Definition at line 71 of file gxnode.h. 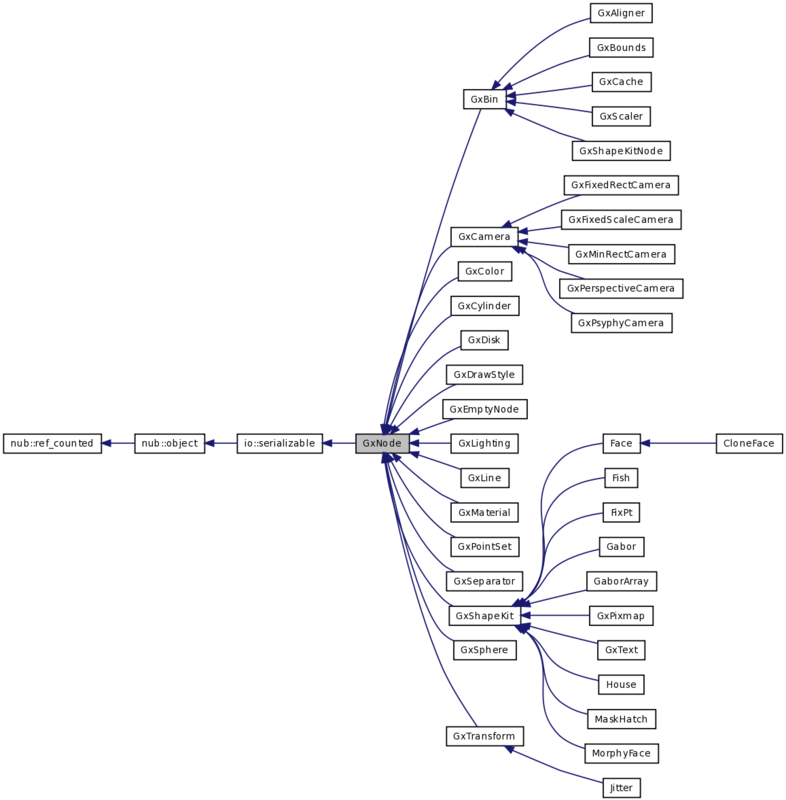 Returns true if other is contained within this node in the scene graph. The default implementation (for leaf nodes) returns true only if this == other. For composite nodes, the function will check recursively is other is contained within the composite structure. This function is used to avoid generated cycles in the scene graph. Definition at line 83 of file gxnode.cc. Returns an iterator to all the children recursively contained in this object. Definition at line 89 of file gxnode.cc. Subclasses override this to transform the bounding box according to how that subclass is rendered. Implemented in GxAligner, GxBounds, GxCache, GxCamera, GxColor, GxCylinder, GxDisk, GxDrawStyle, GxEmptyNode, GxLighting, GxLine, GxMaterial, GxPointSet, GxScaler, GxSeparator, GxShapeKitNode, GxShapeKit, GxSphere, and GxTransform. Implemented in GxAligner, GxBounds, GxCache, GxPerspectiveCamera, GxFixedRectCamera, GxMinRectCamera, GxFixedScaleCamera, GxPsyphyCamera, GxColor, GxCylinder, GxDisk, GxDrawStyle, GxEmptyNode, GxLighting, GxLine, GxMaterial, GxPixmap, GxPointSet, GxScaler, GxSeparator, GxShapeKitNode, GxShapeKit, GxSphere, GxText, GxTransform, io::proxy< C >, io::const_proxy< C >, output_file, tcl::ProcWrapper, Block, CloneFace, ElementContainer, EventResponseHdlr, ExptDriver, Face, Fish, FixPt, Gabor, GaborArray, House, Jitter, MaskHatch, MorphyFace, NullResponseHdlr, ResponseHandler, Sound, TimingHandler, TimingHdlr, Trial, TrialEvent, FileWriteEvent, GenericEvent, and MultiEvent. This page was generated Wed Dec 3 06:54:53 2008 by Doxygen version 1.5.5.